Fittingly, the film screened on a wet Sunday morning at the Telluride Film Festival prior to a lunch hour discussion about the state of movie distribution and film criticsm. Today’s talk exhibited many of the same tensions that faced young Grig in Caranfil’s latest film: people at odds with themselves over emerging forms of creativity, not to mention that ever-present battle between art and commerce. “Movies are a 20th century art form,” declared filmmaker Paul Schrader, in Colorado with his latest feature film, “Adam Resurrected.” “Movies have run their course,” he added, advocating in favor of small screen forms of storytelling and distribution, but questioning how filmmakers can collect enough revenue from new avenues to make their work profitable. Fellow panelist Jonathan Sehring, head of IFC Entertainment, advocated patience with emerging outlets that can deliver real money in the long run. “Paul, you are killing me, man,” countered Sony Pictures Classics co-president Michael Barker at the other end of the crowded, makeshift town courthouse stage. “The danger here is absolutism,” the Sony exec told Schrader, “It’s always been hard…I think disribution is more exciting than it has ever been. You have so many models now.” Then, switching gears to delve into the challenges facing criticism, Barker blamed the Internet for harming criticism, saying that online, bloggers and established critics are given equal stature. People don’t want to read, he continued, adding that folks simply don’t value longform, print criticism and decrying the lack of credible online outlets for quality writing by name writers. 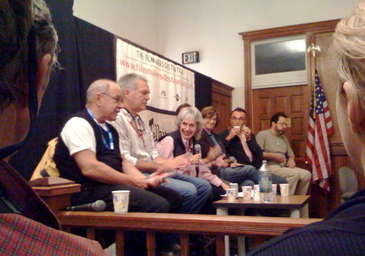 Rather typically, the debate was broadly framed as a battle between traditional models of theatrical distribution aimed at “older” audiences who watch films in theaters and value print newspaper reviews versus new ways of pushing content to a “younger” short attention span generation that prefers to watch film and TV via an iPod. As the discussion contined some participants began to dig a bit deeper. Such was essentially the case in Grig Brezianu’s Bucharest in 1911 as he sought to pursue film as a new art medium, butting up against other forms such as the popular theater. “Can one build a lasting work out of such fragile material,” wondered Brezainu’s would-be producer when Grig showed him the flammable stock used to record and print movies. Needless to say, cinema emerged and Brezainu’s producer quickly exploited and swiftly profited from the increasingly popular art. Evoking his character’s idealistic exclamation about the future of cinema, Romanian filmmaker Nae Caranfil — his latest film still lacking distribution in the United States — noted that last year’s Telluride hit “4 Months, 3 Weeks and 2 Days” achieved just that international success that Grig had imagined, winning the Palme d’Or in Cannes just as “The Rest is Silence” was released back home. Later at the panel, IFC’s Jonathan Sehring noted that, despite a Cannes prize and rave critical reviews, Christian Mungiu’s “4 Months, 3 Weeks and 2 Days” wasn’t a blockbuster. It earned about $1.2 million at the box office, but he added proudly that it did great business on a new platform, reaching as many people via cable on demand as it did in its traditional theatrical release. indieWIRE’s Eugene Hernandez is reporting all weekend from the Telluride Film Festival in Colorado.